I am trying to get back into Teaching with WordPress after a weeks holiday with little Internet. Given I am using my long train commute to do this there are many points on my journey where I have no internet connection. This should not be a problem as I have a plan. I have subscribed to the aggregated course RSS feed. I sync FeeddlerPro over breakfast. Then on the train I can read posts and compose comments in Drafts. I can post these when I’ve a connection or when I get home. The problem comes when someone has their blog set to show summaries of their posts in their feed. Just when my interest is caught my connection dies! I know that some folk want eyeballs on their site rather than my RSS reader. Other folk many not have thought about it. If you are in the latter camp you might want to change your settings. 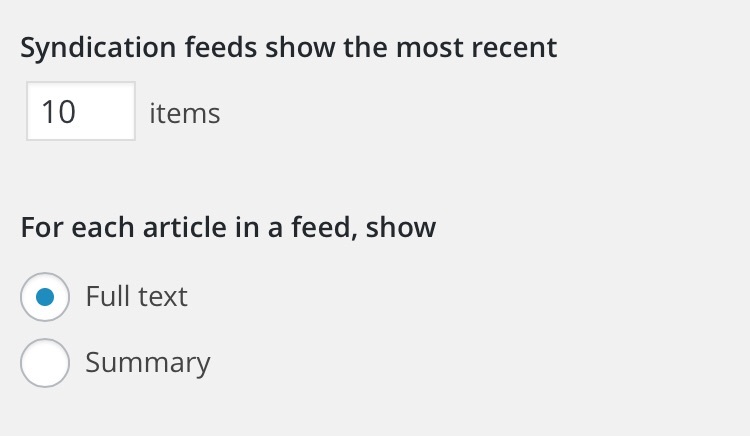 Settings – Reading – For each article in a feed show: full text. Good point, John. I am pretty sure I have mine set to full text, because I remember having a similar issue with RSS readers in the past–it was annoying to just get a small snippet rather than the full post! But that said, something weird is happening with the syndication to the Teaching with WordPress site for this post and the one right after it. On the blog hub, these just have the titles and not even a snippet of the post. What’s strange is that your latest post does show more of the post on our site. I’ll see what I can find out about that b/c now I’m curious! Nice caught by my own petard! I think I made some posts here on train, using WordPress iPhone app and poor connection, seems to have thrown things out of joint. One came through without a title.